Sign up for free and just shop with Europcar as normal. Our average member earns over £300 cashback a year. France / Germany / Italy / Portugal / Australia / New Zealand / Belgium / Spain / UK & Ireland bookings. Cashback can be earned on bookings made via www.europcar.co.uk for France / Germany / Italy / Portugal / Australia / New Zealand / Belgium / Spain / UK & Ireland cars. Europcar cashback can be earned simply by clicking through to the merchant and shopping as normal. Europcar Cashback is available through TopCashback on genuine, tracked transactions completed immediately and wholly online. Get your finances in gear when booking car hire by making great savings with our Europcar discount code and cashback deals. Whether you are a business or leisure traveller, the European leader when it comes to car rental services can offer flexible driving solutions to meet your individual needs. They can provide short and medium-term rental solutions throughout the UK, while they also have a presence in more than 140 countries worldwide, and with an average fleet of 200,000 vehicles, you are sure to find what you are looking for. If you are going on holiday, they offer a 24/7 service at most major airports, and will wait for you if your flight is delayed. They only hire new cars, they offer 24-hour roadside assistance and there are no hidden charges. Whether you are looking for a rental car or van, or want to book prestige car hire, you will find great offers and services when it comes to protection, extras, business solutions and adding another driver. You can earn rewards through their Privilege Loyalty programme. 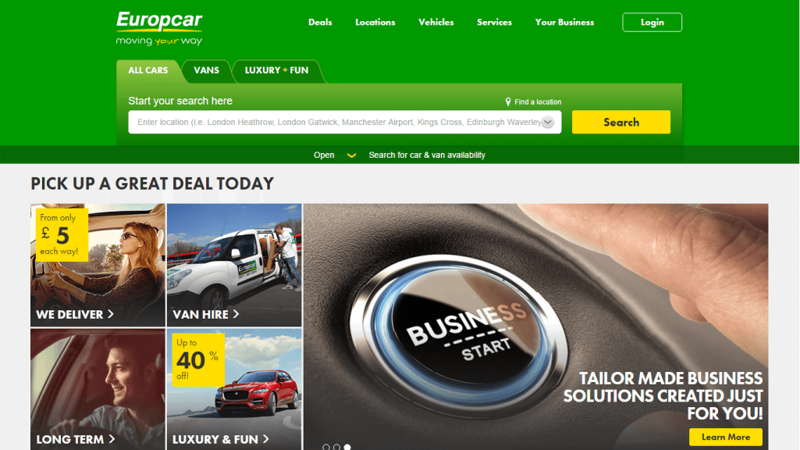 Whether you are going on a business trip, road trip or holiday, you can book online on the Europcar website, no matter if you are looking for rentals in the UK, Germany, France, Italy, Spain or numerous other destinations, and save with our Europcar promo code deals. Select a country or enter a place name in the search bar to find locations near you, while you can narrow down your search by using the airport, train station, port and city centre filters. Once you have chosen your rental location and the day and time you want to pick up and drop off your vehicle, you will be presented with a list of cars and rates from which to choose. Download the mobile app from the App Store or Google Play for your Android device, iPhone or iPad and you will be able to book car hire on the go in a matter of seconds if you are planning a last-minute trip. Find your nearest branch and contact them in a few clicks, while you can manage all of your Europcar bookings from the palm of your hand, as well as add reservation details to your calendar. Modify or cancel bookings if you need to, while you will benefit from great offers throughout the year if you subscribe to their notifications. Sign up to Europcar's Privilege loyalty programme for free to enjoy new features and benefits. Enjoy fast, easy pick up with no queues or paperwork through this service, while you will earn a free weekend hire once three hires are made on public rates. Once you complete your second hire, you will receive a £10 discount voucher to redeem against your next hire, while if you are hiring on company rates, you will receive a free weekend reward and be upgraded to the next tier level - Privilege Executive - when you reach 10 hires or 40 hire days. Other Privilege benefits include guaranteed bookings, where they reserve your car and keep it for you even if you are delayed, frequent traveller miles/points and exclusive benefits from their partner, AccorHotels, giving you up to 15% off Mercure, Novotel, Sofitel and Pullman hotels worldwide when you travel. Your Privilege membership lasts for two years, giving you more time to accrue credits. You will be able to drive a hard bargain with these cashback deals on car hire. Europcar is the leader in car rental services in Europe, serving business and leisure customers and providing flexible driving solutions which fit individual needs. They have branches all over the UK and offer a wide range of makes and models to meet your needs. They offer flexible pick up and drop off options. Whether you are looking for car hire, van hire or prestige car hire, you are sure to find what you are looking for.